For this lecture, please read this entry on Parmenides, and this entry on Zeno. Parmenides (510 – 450 BCE) was born in Elea, a Greek colony on the southern coast of what is today Italy, near Croton, the place Pythagoras set up shop. Parmenides became known as the founder of the Eleatic School, and Zeno and Melissus, who we will cover next, were the school’s second and third famous philosophers. 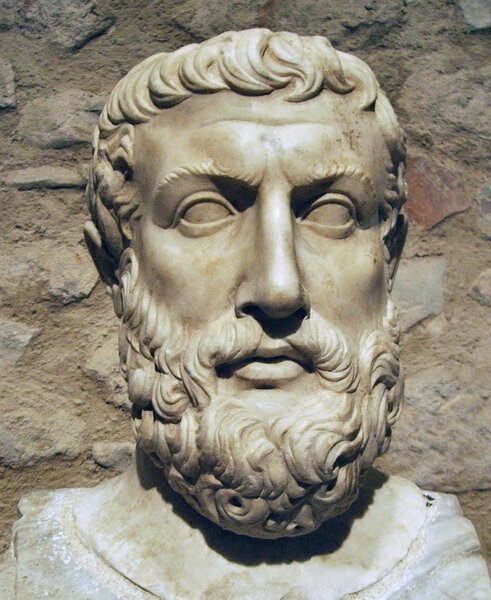 Born from a wealthy family, Parmenides became known as an excellent orator and legislator. 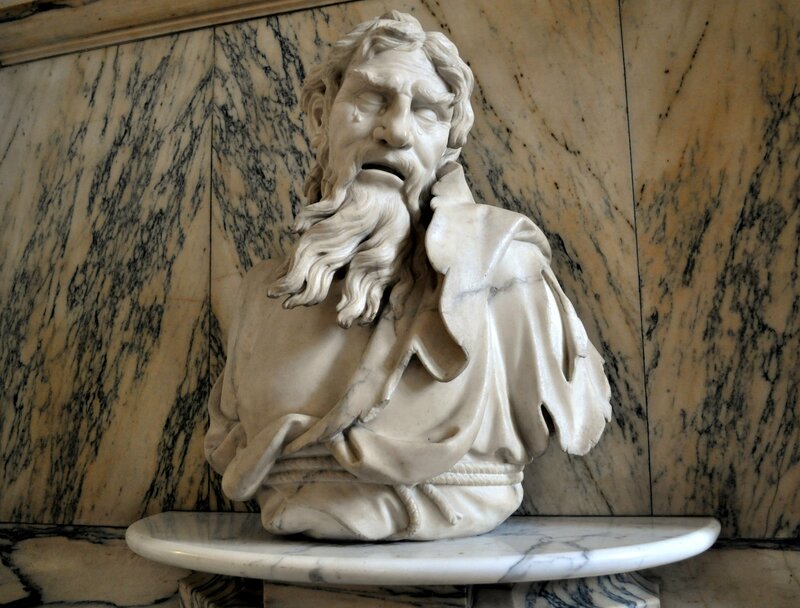 He was known for leading an admirable life, and the phrase ‘a Parmenidean life’ was known to later Greeks as a noble existence of simplicity, morals and discipline. Xenophanes may or may not have taught Parmenides, but either way he was clearly a major influence. We saw in studying Xenophanes that there are potential problems in his thought, as he claims the One, monotheistic being, does not move but shakes and causes all things by its thought. Parmenides seems to be trying to resolve these problems, but to do so he enters into different yet equally paradoxical waters. 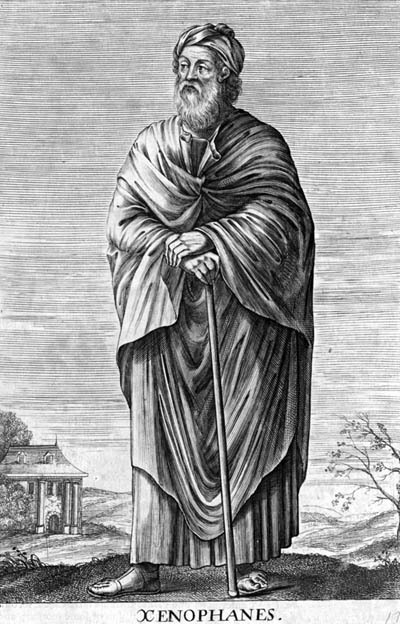 Diogenes Laertius says Parmenides was taught by a Pythagorean named Ameinias. Parmenides seems to agree completely with Pythagoras’ account of the universe, but strangely believes this is mere mortal opinion and illusion, how reality appears to us but not the whole truth of how it actually and fully is. Parmenides even states that males are conceived in the right part of the uterus, and females from the left, following the paired oppositions of the Pythagoreans. Parmenides had a large influence on Plato. Plato revered Parmenides, in his dialog The Sophist calls him ‘Our father Parmenides’. In Plato’s early dialogues, Socrates sounds very much like Heraclitus, questioning whether human beings can ever be said to truly know anything. In the middle and late dialogues, Socrates begins pursuing the true and the good, giving it order and shape. Modern scholars are in general agreement that Plato increasingly placed Parmenides and Pythagoras over Heraclitus in his dialogs through the mouth of Socrates, dividing the cosmos into the immortal and unchanging above and the mortal flux of opinions and shadows below. The forms of things, the eternal models from which all things come, are unchanging, and so knowledge of these can be absolute and true. Plato follows Parmenides in dividing truth and knowledge from appearance and opinion. Like Heraclitus, we only have the opening and fragments of Parmenides’ only work, On Nature, a work of poetry like that of Xenophanes and with the same title as the work of Heraclitus. In it, an unnamed goddess instructs the narrator, Parmenides himself, who journeys from darkness to light (“leaving the house of night for the light”) accompanied by daughters of the sun in a chariot. The daughters pull back their veils from their heads, a gesture likely standing for enlightenment and revealing. The word ‘apocalypse’ comes from ancient Greek for ‘revealing’. While Christianity, with its origins partly in Greek philosophy, has associated the word with the end of the world, this would merely be the final apocalypse, any great revealing of truth being an apocalypse and thus a wide variety of ‘apocalyptic literature’. Parmenides’ On Nature is an example of this genre. The ascent into the heavens to acquire knowledge and descent into the world and/or underworld is a theme common in ancient cultures including the Homeric Greek myths. Parmenides is being converted and initiated into the mysteries, found in mystery cults like that of Pythagoras. The cosmos contains secrets that only revealed to the few who make the journey. For Parmenides, there are two roads, one day and the other night, with gates and doors in the sky. Strangely, this means that as Parmenides ascends into the sky, he leaves the house of night below, only to find the doors, the destinations of the roads of day and night, to be up in the sky. 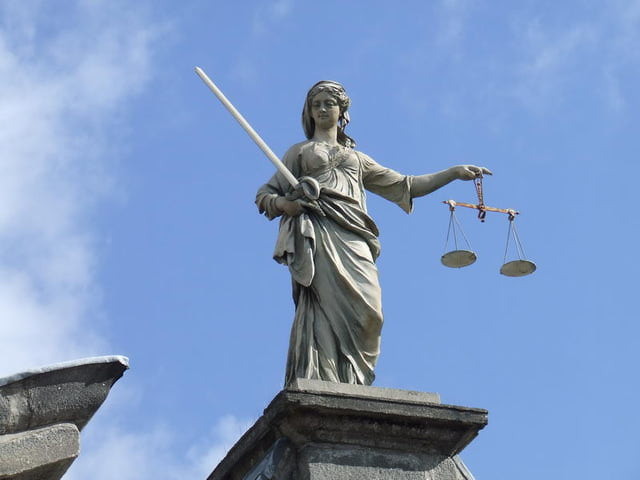 Justice, the goddess Dike, holds the keys to the two doors. She is said to be ‘avenging’, implying that she allows the good through the door of day and pushes the bad through the door of night based on merit. The daughters of the sun convince Dike to open the doors with soothing words, and the chariot presumably flies through the door of day to meet with ‘the goddess’, either Dike or some other unnamed divinity. Parmenides, departing from Homer and Hesiod, says that this goddess (possibly Dike) governs all things, and that of all the gods she created Love first, likely Aphrodite, known to the Romans as Venus. She explains that though there is no reliance on the opinions of mortals, but that opinions and appearances are a part of the larger whole which can be found on the road of and through the door of day, the light. The goddess says that Parmenides must learn the persuasive truth, far above the common ‘beaten path’ of humanity. This implies that various opinions, contradicting philosophical positions, are not persuasive as the one common truth is (a position identical with Heraclitus). Parmenides argues that because we speak and think about something, something must exist as opposed to nothing. Thought is likened to the limbs of a body, and the unity behind the thought in an individual mind is the same unity for everyone and the cosmos itself. This means that the oneness of a particular being (say, a frog), the conception of it as a particular being (our concept of the frog), our conception of ourselves as having perceptions and conceptions of the being, and the unity of the cosmos are all one and the same unity, misunderstood and misthought by the mind to be here at a certain time and there at another. The way of truth is described, and differentiated from the way of appearance/opinion. Again, this is identical to Plato’s separation of knowledge, which must be unchanging, from opinion, which is partial, relative and mortal. It is also similar to the Pythagorean Y. The way of night and day are distinguished as that which is and that which is not, two approaches. Parmenides suggests that thought, when fallen and foolish, takes things apart and makes them different for us in thinking they are different, obscuring the unity of things in the One that is whole reality. In naming things, ‘marking’ them, we are the ones who separate and unify our reality, obscuring or revealing the great unity as much as we can. The lower way is quite identifiable as the position of Heraclitus, in which all things change and so there is only perspective and relative truth. Parmenides sounds exactly like Heraclitus in condemning his position, arguing those who say that being and nonbeing are the same and are not the same, and who say that the road of all things turns back on itself, are deaf and blind wanderers. Recall that Heraclitus said the road forward is the road back, and day and night are one. Parmenides sees Heraclitus as a common sleeper, incapable of distinguishing between day and night and thus in darkness, while Heraclitus would say Parmenides is a foolish expert who thinks he knows the complete and unchanging truth, who thinks he can separate day from night, and is thus in darkness. Most scholars today accept that Parmenides is writing this in direct response and opposition to the work of Heraclitus. Parmenides argues that which permanently IS must be eternal and unborn, just like Xenophanes says about his infinite god that is being, and also the same as Heraclitus says of the cosmic fire that gives rise to all things. Because change and becoming involve nonbeing, as Heraclitus argues, being cannot involve any change as being does not admit any nonbeing. While Heraclitus says there is only one unchanging thing, the supreme One cosmic fire, as opposed to the many particular beings that change, Parmenides argues that because there is only one unchanging thing, including all particular things, all particularity and change is an illusion. Nothing comes from nothing, Parmenides argues, “Ex nihilo, nihil fit”, in the Latin, from which we get the phrase ‘ex nihilo’, out of nothing or nowhere. All nonbeing, including divisions and differences between things, does not exist. While later Neoplatonists would say that there are many types of nonbeing which exist as not-being in particular ways, Parmenides is rather saying that all types of nonbeing do not exist at all, are illusions given to us by our thoughts. Some have identified this ‘out of nothing, nothing comes’ with the later law of conservation of energy , that energy can neither be created nor destroyed. 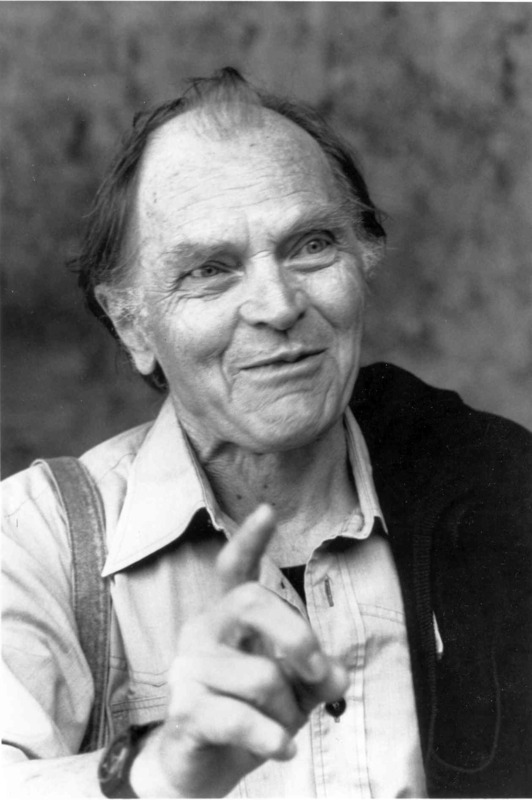 Some philosophers of science like Feyerabend have pointed out that versions of big bang theory of modern physics violate this principle, and that something coming from nothing is not seen anywhere nor duplicatable in a laboratory and therefore scientifically unverifiable. Unlike physicists, Parmenides argues that all motion, all change, is illusion and false. Time is an illusion, an idea found in some Indian thought. Parmenides argues that if things are moving, then they must move into nothingness or void, participating with it, and because nothingness does not exist this is impossible. Parmenides returns to the same two arguments, first that being cannot be involved with nonbeing, and second that nonbeing cannot be. Heraclitus could argue that categorical nothingness does not exist (and indeed we have not found any absolute vacuums or voids), but relative being and nonbeing do exist and commingle. For Heraclitus, this is true insight, whereas for Parmenides this mixture is a confusion and illusion of thought. Parmenides says that in truth, “Coming to being is extinguished, and destruction unknown”. 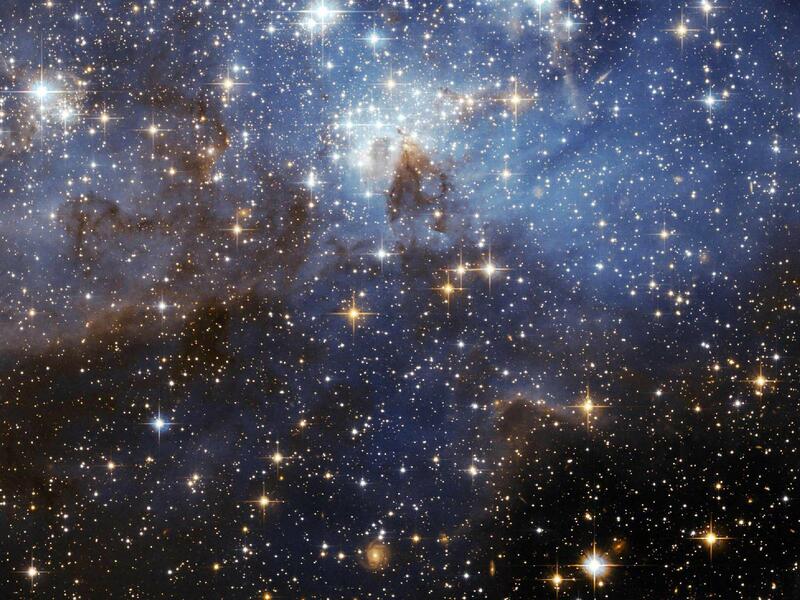 The cosmos does not think or speak, but its awareness is its thinking all things statically. While the same can be said of its speech, its order, another paradox emerges. If the One is undivided and without differentiation, what order is there? There can be no true order other than indivisible and uncharacterizable unity, like the infinite of Xenophanes. Thought and being are the same, and one must think and say for things to be. For Parmenides, any separation of things into particulars is an injection of nonbeing into being, a corruption via thought of the original form and order. Additionally, human thoughts and concepts are temporary and changing, and so being itself can not be said or thought. In this, Parmenides is in complete agreement with Heraclitus. Both believe that reality is a superior One, which is above human comprehension. Heraclitus also allows for it to be unchanging insofar as it is the continuous change of all. Heraclitus and Parmenides are both said to be influenced, if not taught directly, by Xenophanes. To resolve the paradox of Xenophanes’ infinite, Heraclitus says that the stability is consistent instability of things, the unchanging is the constant changing of things, while Parmenides says that the changing of things and the multiplicity of things is an illusion. The One is a continuous thing, is indivisible, and does not have parts or differences in itself. This again is identical to Xenophanes, but Parmenides extends this to all particular things, saying that their particularity and differentiation is illusion. He compares being to a sphere, without parts and continuous along its surface. 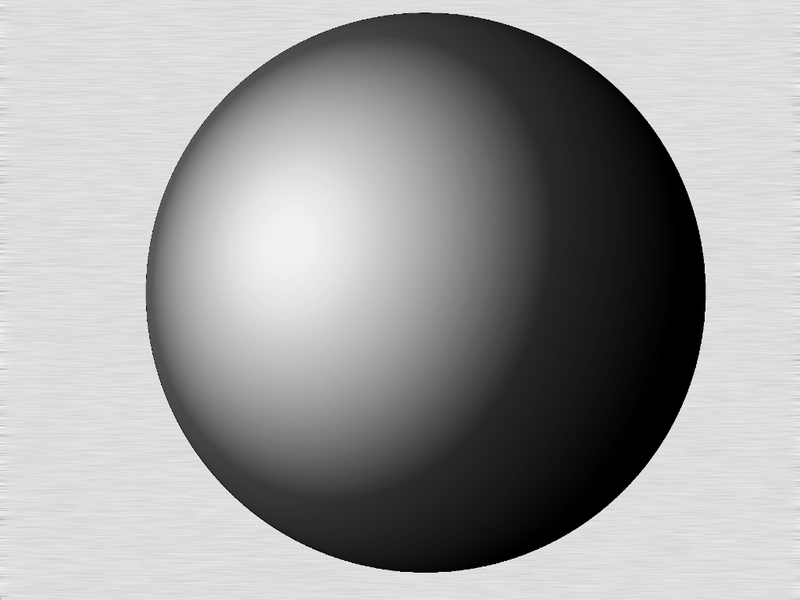 Some have argued Parmenides believed being to be spherical in shape, others that he is arguing being is without shape of any kind and he is merely using the sphere as a metaphor. Remember that Heraclitus was the first to use the term ‘Logos’ for the order of the cosmos, identifying it with speech. For Parmenides, we can’t know truth through perception, but only by Logos, by order itself, though Parmenides, like Xenophanes, is committing himself to saying that the One does not move or actively order as that would be change and difference. Like Heraclitus, Parmenides says the truth and knowledge is aetherial light, identifiable with the higher elements, and untruth and opinion is darkness. Similarly, the road to permanence is separate from the road to destruction. Both Pythagoras and Parmenides apply this to individual human conduct and the physics of the cosmos. Parmenides seems to agree with Anaxagoras’ and Pythagoras’ description of the formation of the cosmos and how it came to be by separation of the elements, which is strange as he believes this not to exist. Scholars agree that Parmenides’ goddess describes Pythagorean cosmology and then says that this is the opinions of mere mortals. Thus, Pythagoras is completely correct about what the cosmos looks like to human beings, which is wrong and an illusion. Like an optical illusion, we all misperceive things the same way. Persian Zoroastrians believed that Ahriman, the evil spirit or God, polluted the world in the beginning, known as ‘the lie’ and ‘the drug’, in Persian ‘druj’, from which we get our word ‘drug’. Like Heraclitus, Parmenides shares a decently monotheistic cosmos with the Zoroastrians, and identifies order with Logos even though the cosmos can not move or speak the way that mortals do. 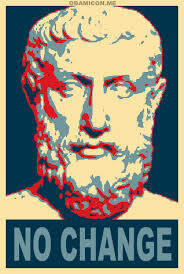 Parmenides’ claim that all change is illusion and unreal is known to modern scholarship as ‘The Eleatic Challenge’. Philosophers responded with their own answers, showing that Parmenides was influential but also controversial. Human thought is always both agreement and disagreement, just as Heraclitus says that arguing against each other we agree, and singing together we compete. 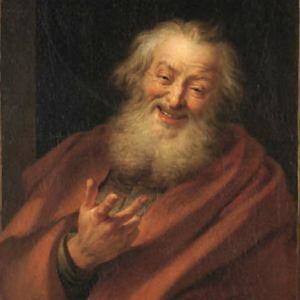 Democritus, called the laughing philosopher by Juvenal, and the atomists who we will study soon tried to resolve the paradox with unchanging atoms that do not change themselves and are eternal but recombine to make the changing things we perceive. Once again, the unchanging is just beyond our perception even if it is within our comprehension. Einstein believed in ‘block time’, that while we perceive time as moving that all of time already exists as a static whole. The philosopher of science Popper, who taught the more skeptical Feyerabend, called Einstein ‘Parmenides’ as an insult for holding this view. Einstein was a determinist, saying, “God doesn’t play dice with the universe”. 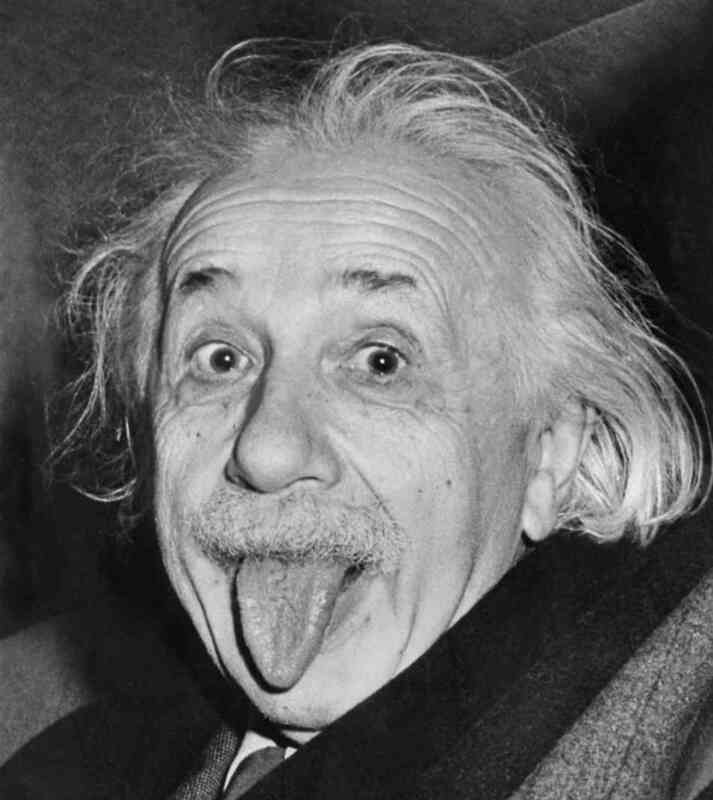 Later chaos theorists criticized Einstein as not enough of a relativist, not believing enough in relativity, as Einstein argued that time and space are relative but not necessity and chance, as necessity is absolute and chance is an illusion. 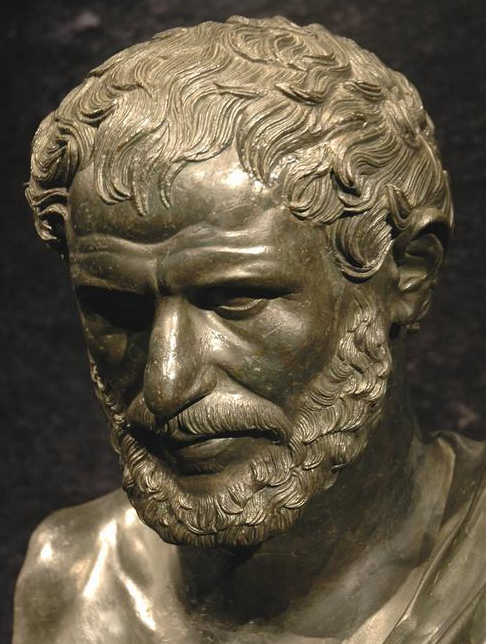 Chaos theorists argued that necessity and chance, like time and space, are also relative, a relativist position much like Heraclitus and unlike Parmenides. Zeno (490 – 430 BCE), also known as Zeno of Elea, is the most famous and influential of the Eleatic school after Parmenides. In Plato’s dialogue Parmenides, a major source for the life and thought of Parmenides and Zeno, Plato says Parmenides was 65 and Zeno 40 when the two visited Athens to spread their teachings, and Socrates is very young. Plato says Zeno was good looking and loved by Parmenides, which many believe meant that the two had a physical relationship that does not disturb Plato or Socrates in the slightest. 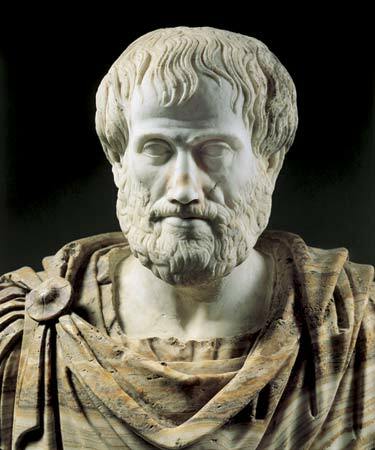 Aristotle says Zeno invented dialectic, reasoning back and forth from both sides to find the truth. Assuming the principle of noncontradiction, which Aristotle endorses, if one side contains a contradiction, you can eliminate it. This is also known as ‘reductio ad absurdum’, reduction to absurdity. To eliminate a position, we would start, “Suppose you are right, and X is Y…but this leads to a contradiction, so we know that X can not be Y”. However, Zeno used dialectic differently, as he assumed all human arguments and concepts contain contradictions. This is similar to the goddess of Parmenides arguing for Pythagoras’ view and then saying that it is illusion. For Parmenides and Zeno, as well as Heraclitus, all human concepts are incapable of grasping the truth in itself, apart from anything. Diogenes Laertius wrote that Zeno was very skilled at arguing all sides of a position, and that he was imprisoned and killed by King Demylus of Elea, possibly for arguing against his position and contradicting the king. Plutarch, the Roman historian, wrote that Zeno tried to kill Demylus, and when he failed and was captured, he bit off his own tongue and spit it in Demylus’ face, killing himself. While none of Zeno’s writings have survived, he is famous for his paradoxes, discussed by Aristotle and many others. There were supposedly forty arguments that resulted in contradictions, but only nine survive today found in the writings of others, and some seem to be alternate versions of the same arguments. 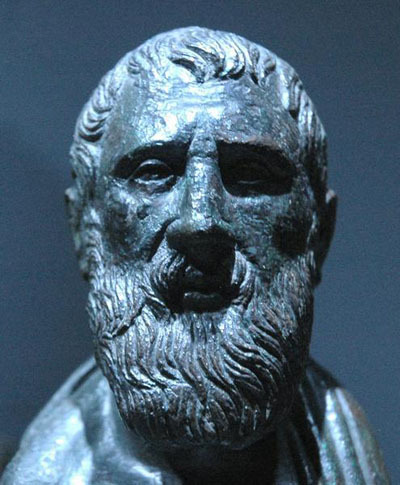 While some have thought that Zeno’s paradoxes are meant to show that reality is paradoxical, Zeno intended his arguments to show that human beings are incapable of knowing true reality with human thought, and that any attempt to know the whole or a part of the whole results in contradictions. Thus, while things seem to clearly move in front of our eyes, when we try to argue how they move our thinking becomes entangled in contradiction and paradox. Remember that Xenophanes said no one will know the truth of the things about which he speaks, the One and the supreme order of reality. If true, this means that Zeno was not trying to eliminate one side of a dialectic, but show that all sides of an argument result in contradictions as no differentiated human argument or conception can be the supreme undifferentiated unity itself. While mathematicians have supplied further conceptions to make sense of Zeno’s paradoxes, there is still no general agreement on the paradoxes, how they can be resolved or even if they are indeed paradoxes and genuine examples of contradiction. For the his paradox of nonbeing, Zeno argues if being is many and not one, then being contains nonbeing and what is alike is not alike, which is impossible, as the similar cannot be different and the different cannot be similar. This is entirely in line with Parmenides and antithetical to Heraclitus. If being is absolute, not relative, then nonbeing cannot exist at all, in any form or to any degree. Thus the paradox: nonbeing seems quite real, but cannot really be. For his paradox of place, Zeno argues if things have a place, then a thing’s place has a place, and this place has a place, ad infinitum. This would be true of Anaxagoras’ infinite cosmos, unlike Hesiod’s cosmos in which it takes an anvil nine days to fall from the height of the heavens to the earth. Because this results in an infinite regress, we have a paradox: finite places are not infinite, but there can’t be a finite place without an infinite regress. Zeno’s most famous paradox is the paradox or impossibility of motion, which Aristotle attacks extensively in his Physics. There are three versions of this argument that are nearly identical: the Tortoise and Achilles, the dichotomy argument, and the arrow in flight. 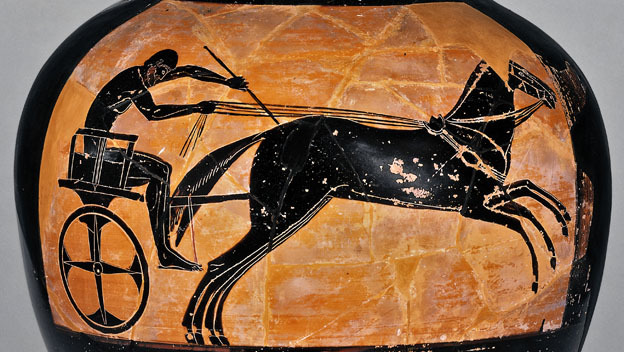 In the Tortoise and Achilles version, Zeno argues that the quickest runner cannot overtake the slowest given a head start, as there are an infinite number of points to cross and this leads to an infinite regress. Say that a tortoise is given a ten meter head start, and Achilles attempts to catch up. First Achilles must reach the point from which the tortoise started, to find that the tortoise has gained a bit of ground. Then Achilles must reach this next point, only to find that the tortoise continues to crawl ahead. There seem to be an infinite number of points ahead of Achilles that he must cross, as each point reached spawns a new point of destination. Therefore, though we all know Achilles can catch the tortoise, it seems that he must cross an infinite number of points to do it. The dichotomy argument works similarly, but with one mover moving towards a fixed position. To get to the destination, the mover must cross half the distance, then cross half the remaining distance, and again and again until the destination is reached, which seems impossible given that there is a never-ending set, an infinite regress, of half-segments to be crossed. The path is finite and infinite at the same time, which cannot be. For the ‘arrow in flight’ argument, Zeno argues that at each point along an arrow’s path, the arrow is not moving, as it occupies a single space in a moment of time. This means that the arrow, as it moves, is unmoving at each point. Because a thing cannot move and stay unmoving at once, all motion is impossible. Neo-Platonists were concerned with the infinite, the finite and the problems of the two being involved with each other. 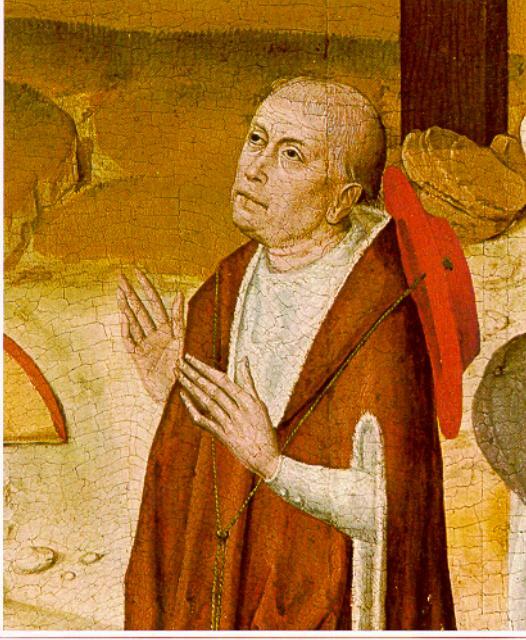 Nicholas of Cusa, a medieval German Neo-Platonist, argued that we can conceive of the infinite, and thus our mind must be in some way infinite itself. He uses the example of a mustard seed, asking us to imagine an infinite supply of earth, water and light for it to grow. Clearly having the parable of Jesus in mind, Nicholas argues that a single mortal mustard seed would multiply endlessly in these conditions, giving us a real physical infinite regress in both the growth of the seed and our comprehension that this growth is infinite. The later German philosopher Hegel, who is well aware of the work of Parmenides, Zeno and the Neo-Platonists, argued that the infinite was present as the finite, using the image of a circle as unending. 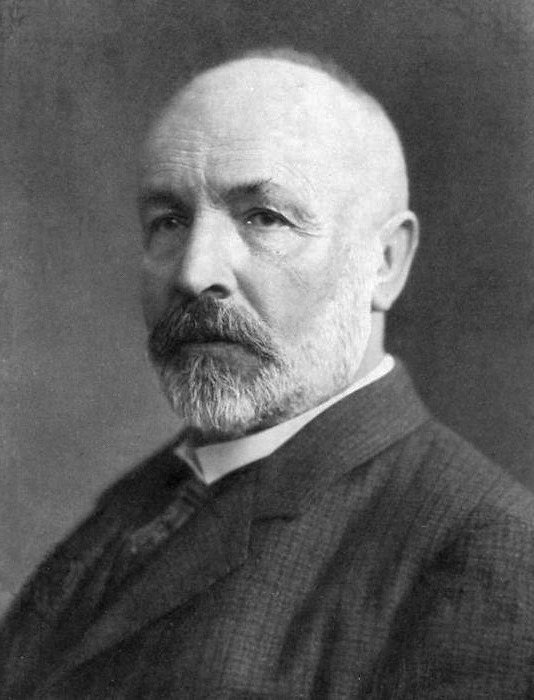 Similar work with the infinite of the German mathematician Cantor drove him temporarily insane and he was committed to an asylum after discovering his famous Cantor Set. If you imagine a line that splits into two segments in the middle again and again in each part, after an infinite number of splits you would have twice that, twice as infinite, number of sections. If our reality is infinite, not having a beginning or end, that would mean that everything is infinite but some infinite is more or less relative to other parts, which is how things move at particular speeds. 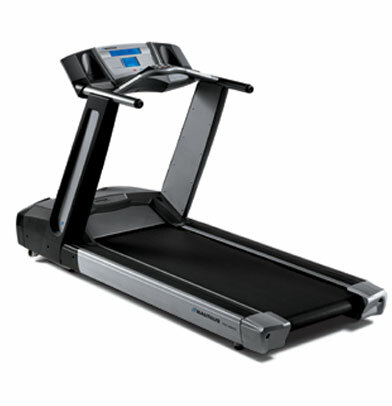 Consider two treadmills, one running twice as fast as the other, but both moving without cease. While both eventually result in an infinite amount of motion, one moves twice as much as the other, such that one infinite is twice another infinite. From the perspective of the slower treadmill, even if both moved at infinite speeds, imperceptible to us, while it stays immobile the faster treadmill moves at a constant and finite speed. Consider the arrow in flight of Zeno’s motion paradox. The space the arrow must cross is infinite insofar as it is infinitely divisible. To cross any space is to cross an infinite distance, which is not impossible if the motion is itself infinite, but greater relative to the space. The quicker the arrow crosses the space, the greater it is relative to the space. Aristotle argued that as the space between the tortoise and Achilles, between the arrow and its target, gets smaller and smaller, the time it takes to cross each division of space gets smaller and smaller. Diogenes, who we will study, had his own refutation. After hearing of Zeno’s arguments against motion, he stood up and walked away. This is similar to Samuel Johnson’s refutation of Berkeley’s idealism. Berkeley (for whom our town is named) believed that reality is in the mind and the world is a dream in the mind of God, our own existences being dreams within the dream. 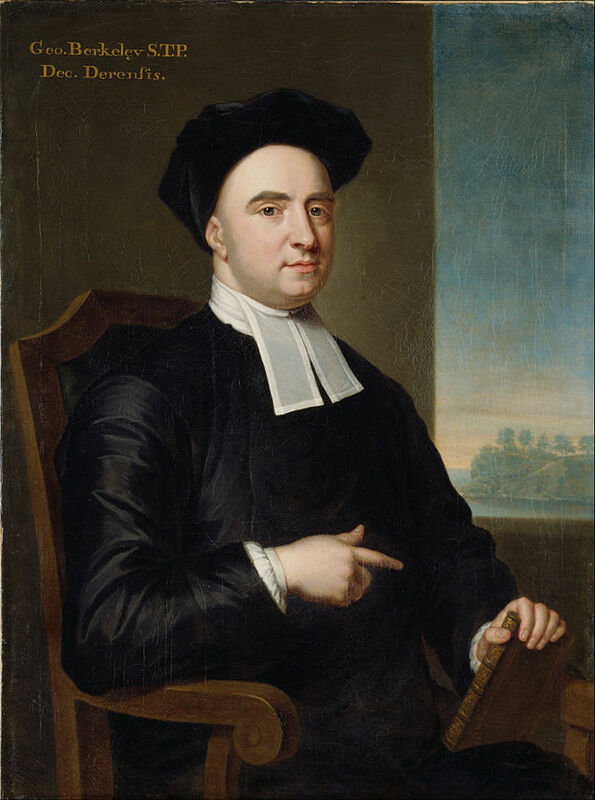 Johnson, walking from church with a friend speaking to him of Berkeley’s thought, kicked a rock and said, “I refute it thus!”. Zeno would reply to both that motion and material seem quite real, but these demonstrations only underscore how argument for the everyday is strangely impossible. 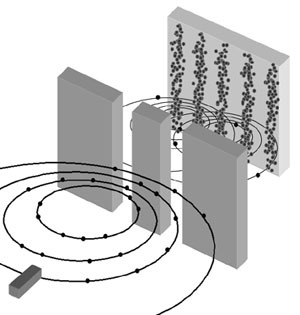 Quantum theorists have recalled Zeno’s paradox of motion in conjunction with the wave-particle paradox, calling it the ‘quantum Zeno effect’, that observation seems to change how reality behaves, either as a unified wave or disunified number of particles whether or not the system is observed. Similarly, if we observe the infinite divisibility of a space, it seems impossible to cross, but only if we consider it’s infinite divisibility, which seems to disappear as soon as we cease to consider it as part of the problem. Similarly, fractal geometry suggests that the organic patterns we see everywhere in the cosmos, as well as our human bodies, result from an infinite number of permutations. 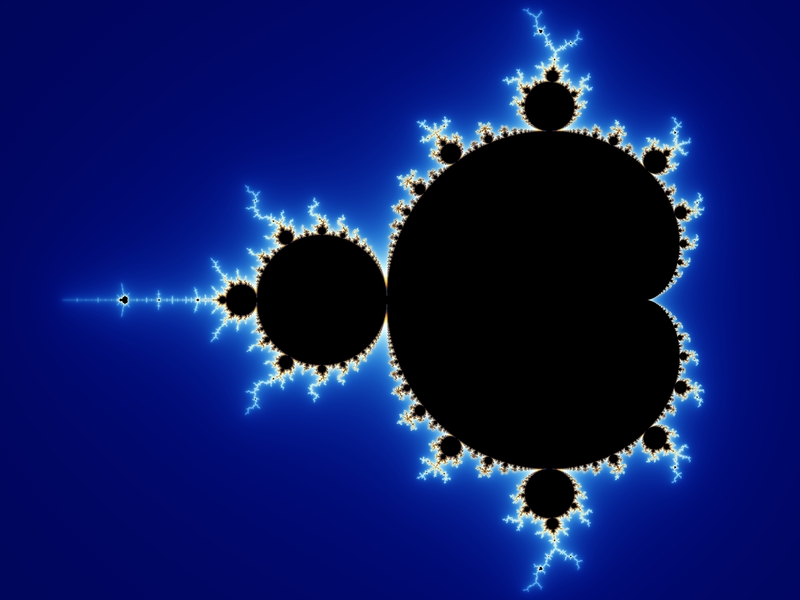 Mandelbrot, while working at IBM, found that he could create patterns that imitate nature by letting simple math games reiterate a practically infinite number of times. The Mandelbrot Set, the overarching pattern of these patterns, is now famous, and there are many websites and YouTube videos exploring the endless complexity of the Mandelbrot Set. Lewis Carroll was fascinated by Zeno’s Achilles and Tortoise, created a dialogue between the two in which the Tortoise, speaking as Zeno, always outsmarts Achilles leading him into paradoxes and infinite regresses. In Hofstadter’s book Godel, Escher, Bach, he considers Zeno’s paradoxes, recreating Lewis Carroll’s dialogue in terms of modern cognitive science and fractal geometry. 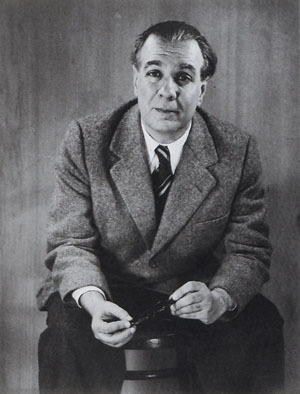 Borges, the Argentinian writer famous for his Ficciones, his short works of surreal fiction, was fascinated by Zeno, and often used infinite regresses. In his story The Library, an unending library with every possible book, including exact copies with one mistaken letter. 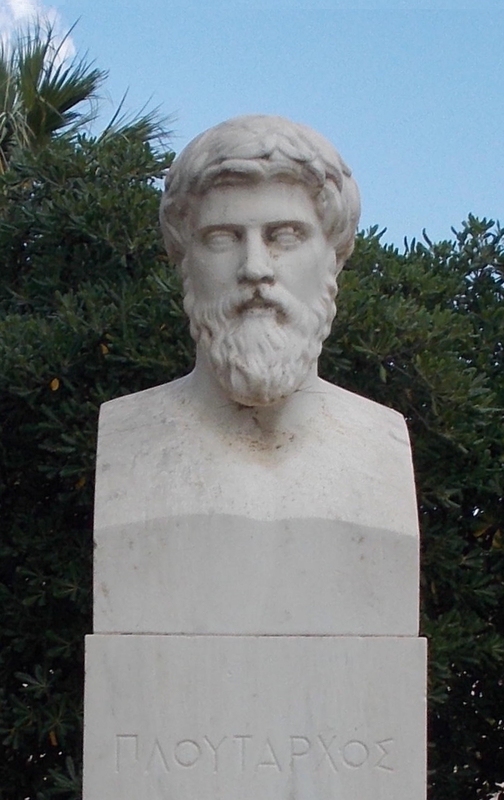 Melissus (500 BCE) was from the island of Samos, the birthplace of Pythagoras. Not much is known about his life. He may or may not have been a direct student of Parmenides. 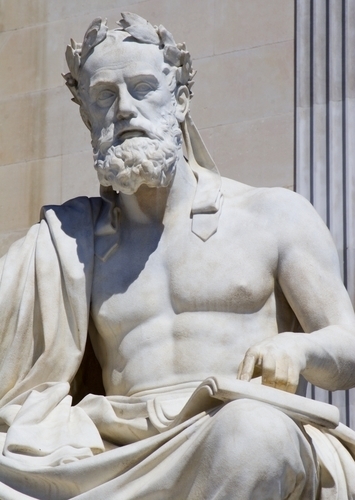 One source says he commanded a naval fleet from Samos that supposedly defeated the Athenian fleet led by the Athenian general Pericles in 441 BCE. Melissus wrote arguments supporting Parmenides and the Eleatic school, like Zeno. 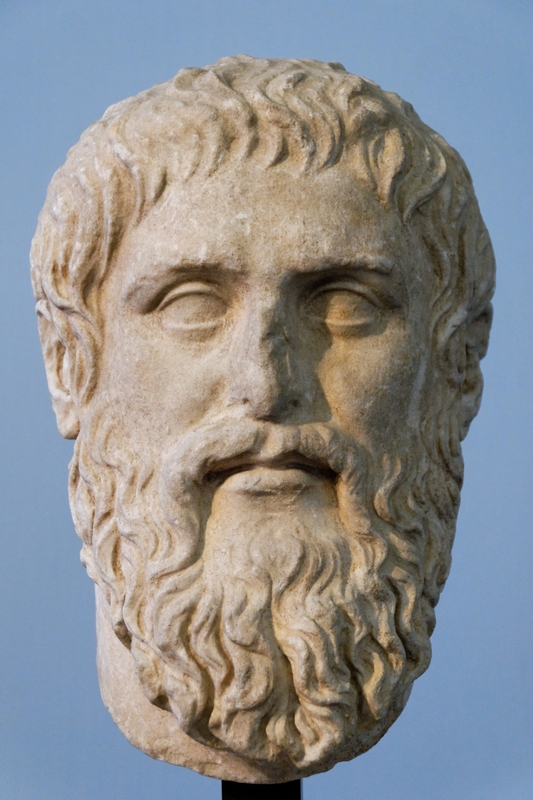 He was a major source of Eleatic philosophy for later philosophers such as Plato and Aristotle, though they considered his work to be inferior to that of Parmenides. Melissus, in departing somewhat from Parmenides, also became an influence on later atomists we will study. Melissus argues that the cosmos, all of being, is eternal, infinite, indivisible, and unchanging. Unlike Parmenides, though difficult to discern, Melissus argued that being is eternal but not timeless, not a single static moment. Being does not change or move, but it extends into the past and into the future endlessly. Also, Melissus argues that the One is spatially unlimited, without explicitly saying that distance and difference is illusion. If Melissus is arguing against time being an illusion, his position is quite similar to Xenophanes, but this would bring Melissus back from the problems of Parmenides’ position to the previous problems of Xenophanes’ position. If the One, which is all, does not move, then how do things move in time? 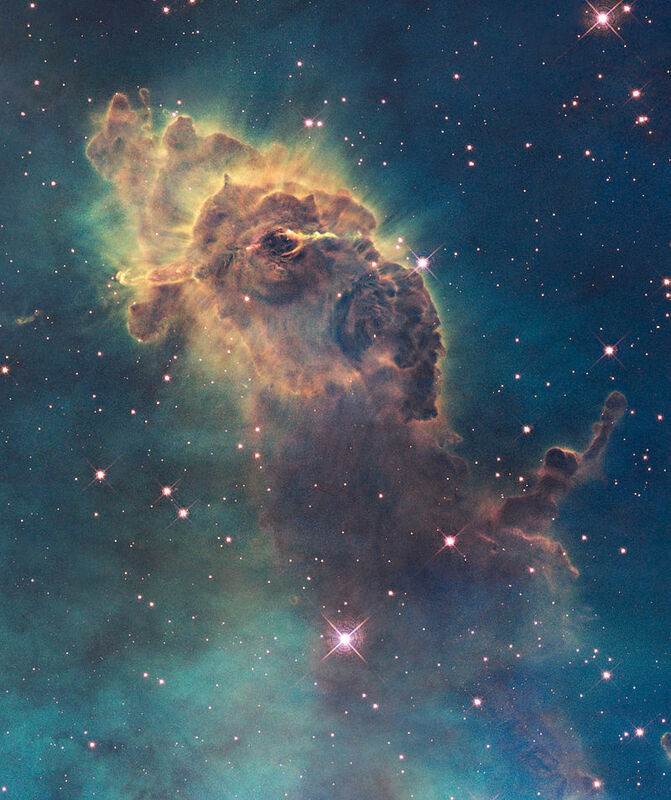 If the One is indivisible, then how is it omnipresent in unlimited space? As some ancient sources have suggested, Melissus may be arguing that the unity of the cosmos, the oneness of the One, is eternal, infinite, indivisible and unchanging but this does not make the many finite, divisible and changing things of the cosmos illusion. 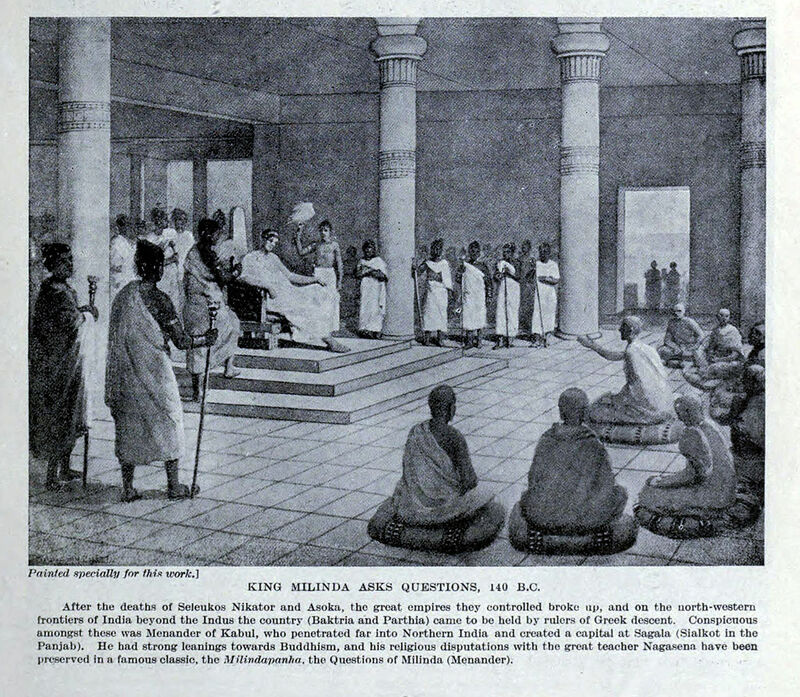 In an early Buddhist text, the Questions of King Milinda (Milinda Panha), a Buddhist missionary is questioned by the king of a Greek trading colony in Northwest India. Many of these colonies existed for centuries, and were sites of exchange between Greek, Persian and Indian culture, including Greek influence on early Buddhist stone carved statues. The missionary and the king enter into a philosophical debate, both well versed in various schools of thought. Using the metaphor of a chariot, shared by earlier Indian thought and Plato alike, the missionary asks the king if the chariot is really its wheels, or any of its parts, or if it is the unity of the parts aside from the parts themselves, to each of which the king replies ‘no’. The missionary says that this is true for the cosmos and the teachings of the Buddha, and the king is pleased with the answer. The missionary, in accord with Buddhist thought, argues that reality is one, and that the oneness of reality is not found in a particular part (omnipresent and characterless) and that it is not found exclusively in the unity distinct from the parts. The oneness is not mere oneness distinct from the many, but a oneness that is the unity of oneness and many-ness, what medieval European Neo-Platonists called ‘hyper-ousia’, a super One that can not even be characterized as unity in opposition to anything, not even multiplicity. Melissus similarly argues that the One that is reality is all oneness and many-ness, that it contains all characterization without opposition and so has no character, a ‘having-no-character’ which is ‘having-all-character’. Exclusively, the One is nothing. Inclusively, the One is everything. This approaches the position of Xenophanes and Heraclitus (who was mistaken for the Buddha by some scholars). While the One does not change, this is an encompassing of all change, not a denial of change as illusion. Melissus argues that the One is full, not empty, and that it remains full without change. This fullness can include all change, in an unchanging fashion. He says the One has no parts, no thickness, and no body. That which includes all parts, all spans of width and all bodies does not itself have distinct parts, has no distinct width and no distinct body. Reality is not characteristically blue, or three inches thick, or has thirteen parts, or is found particularly in the American Southwest. 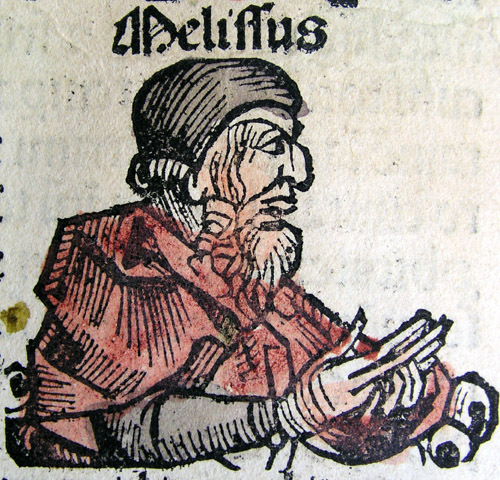 Melissus, as an Eleatic, is strangely Heraclitean in his attempt to resolve the thinking of Parmenides.